The holidays are right around the corner. There is no better time to give the grill lover in your life a gift that they will love. From the latest gadgets in modern grill design to fun seasonings and apparel, here is a list of the top Christmas gifts perfect for every grillmaster. What to get the grill lover who has everything? The handy grill design of the Quesadilla Grill basket makes grilling up a batch of delicious cheesy quesadillas as easy as a few flips of the wrists. Make wonderful mouthwatering Mexican dishes with this reusable basket. Does your loved one’s grill look like it has seen much better days in the past? Surprise your loved one with a professional grill cleaning. They will love their professionally painted, scrubbed, and refurbished grill. Make it look just like new! Rest your freshly cooked meat on this incredible salt plate. The meat will be infused with salt and flavor. Durable and attractive, the Himalayan salt plate will last for a long time. There are a variety of gadgets that will clean a grill easily after every use. The Hammacher Schlemmer Grill Cleaning Robot is one of the higher end models, handling the dirty work of regular scrubbing. Maybe it is time to replace your loved one’s grill? No worries. Order a high-end grill and call a professional BBQ assembly team to put it together for you in a snap! Enjoy years of memories with your new grill. What is more delicious that grilling s’mores? This handy and very affordable Christmas gift quickly makes tasty marshmallow treats without a big mess. Enjoy the sticky sweetness with little clean up! Do you want to get your grillmaster the ultimate in aprons? Imagine an apron with the ultimate functionality of a Batman utility belt, with pockets for gadgets and refreshments, all in a quality camo design. Give the gift of awesome this year. Let the BBQ grill lover in your home enjoy a gift that is uniquely perfect for them. The nights are cooling down, the leaves are changing into a beautiful rainbow of reds, golds, and yellows. Autumn is here, and it’s time to get out the grill, some BBQ metal skewers, and the s’mores. 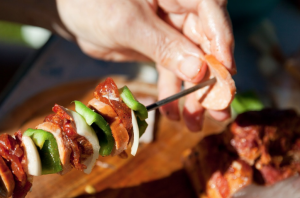 Enjoy these delicious fall grilling ideas with your family and friends. Shish Kabobs are always a crowd-pleaser. 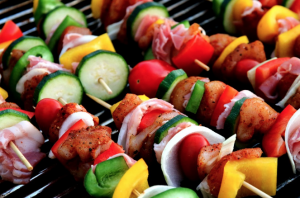 With a tantalizing mix of meats and veggies on BBQ metal skewers, you can please any foodie with this simple dish. Make a Hawaiian inspired kabob with ham, pork, pineapple, and green peppers, or go for a meaty mix of steak, mushrooms, tomatoes, and peppers. For vegetarians, combine different types of squash with scrumptious portabella mushrooms, and lush garden tomatoes. Made popular by the YouTube sensation the BBQ Pit Boys, beer can burgers are a mouth-watering addition to any grill-out. Family and friends will be talking about these burgers for years to come. After seasoning your ground meat to taste, roll the meat into balls about the size of a very large fist. Place a beer can in the middle of beef, molding the meat around the can to make a deep hole. If your burger looks a little bit like a volcano, then you have done it right. Take out the can and wrap the burger in bacon. Now for the fun part! Stuff the hole with a combination of your favorite burger fixings – peppers, onions, mushrooms, cheeses, hot peppers, and more bacon! Grill up the burgers and serve the monstrosity on a bun. Trust me, this is a guaranteed party pleaser! Next time you want to make a batch of chili, try it on the grill. Chilis and stews are relatively simple to grill. Be sure that you have a large cast iron dutch oven or pot. Brown the meat and veggies first. Then make your chili as you would normally, mixing in the canned beans, tomato paste, crushed tomatoes, peppers, onions, and seasonings. Reduce the temperature to around 150 Celsius, and cook for about an hour. Be sure to watch the pot to avoid burning. The smoky rich taste of grilled chili will make your mouth water! 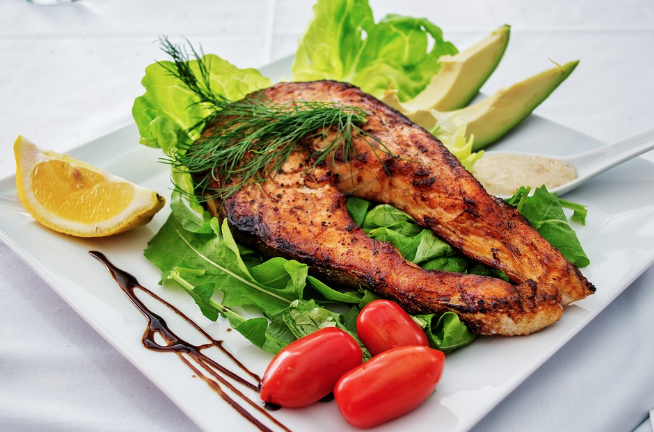 These delicious fall grilling ideas are a great way to bring family and friends together around some really incredible food. Happy grilling! How Do You Grill on a Charcoal Grill? 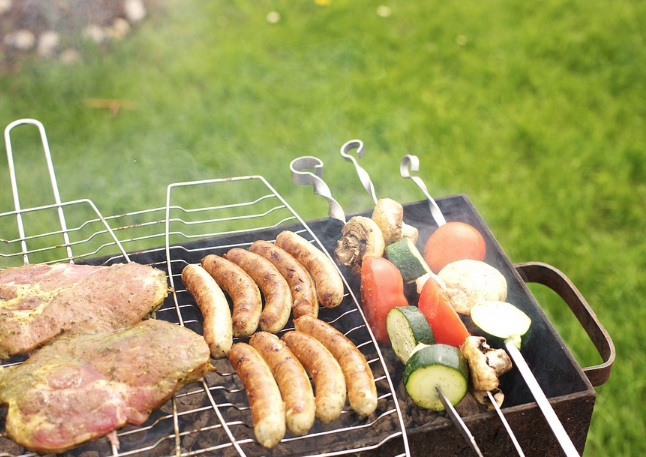 Grilling is a fun year-round activity whether you have a gas grill or a charcoal grill. Learning charcoal grilling for beginners is easy. Just follow these simple tips from grilling professionals. The key to controlling the heat on a gas grill is to adjust the airflow. Charcoal grills have helpful vents located on the bottom of the grill. All you need to do is open the vents. This creates more airflow. The grill becomes hotter, which is ideal for most grilling meats. Simply cool the fire by partially closing the vents. What are some more charcoal grilling for beginners tips? Read more. How do you keep a strong fire going on a charcoal grill? Move the cooking grate and open the vents of the grill. Be sure to clean out ash, which has a tendency to smother weak fires. Let as much air as possible to get to your charcoal. This will start a strong fire with an even burn. It may take as long as twenty to thirty minutes before the coals light. They are ready to use when the briquettes turn an ash-gray color. Oxygen feeds the flame. 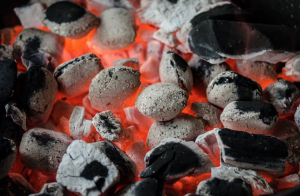 To safely extinguish your charcoal grill flame, simply remove the oxygen by closing the lid of the grill, as well as vents. Be sure to protect your hands and face while using the grill. Never move a hot grill inside a garage or home. Typically, you should wait at least two days before moving it back inside. And always have a fire extinguisher handy. Cooking a steak on a charcoal grill is pretty simple. About fifteen minutes before grilling, take the steaks out of the fridge. Let them sit covered. Brush the steaks with oil and seasoning. Place your steaks directly on the charcoal grill. Cook them to your satisfaction, typically when they are slightly charred after five minutes. Typically, high heat works best for steak grilling. This ensures a tasty steak with a nice sear. Cooking on a charcoal grill is easy. Just follow these simple steps to enjoy a delicious dinner with friends and family.